During this time of the year Grizzly River Run is under refurbishment and drained of water. That means the overflow pool over at Pacific Wharf ups the water level much higher than normal. Yes, Grizzly River Run is directly connected to the Pacific Wharf and Paradise Pier water storage system, which is a pretty neat feat of engineering. The higher water level also helps the reflections of Paradise Pier, raising them closer to the bridge and walkway levels. It's a bit tricky to get this angle, with the guardrail in the way, but it's a cool scene. Peaceful too! 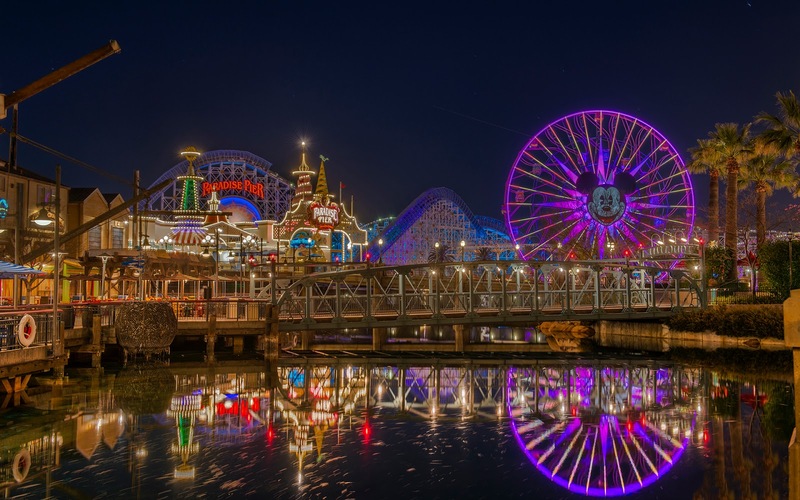 The reflection of Paradise Pier over the water of Pacific Wharf.